Dear yakuza, ex-convicts, & deadbeats. You’re welcome at Japan’s nuclear power plants. Just let us know, okay? The Fukushima Police Department Organized Crime Control Division arrested a senior executive of the Sumiyoshi-kai (住吉会) crime group for illegally dispatching workers to the reconstruction at the TEPCO run Fukushima Daichi Nuclear Power Plant. According to reports by Sankei Shinbun and other sources, the Sumiyoshi-kai boss dispatched men, including yakuza members to a construction subcontractor in Tochigi Prefecture, and these men were sent into the nuclear plant area where they allegedly participated in containment work for the damaged facilities. The charges pertain to labor dispatches from May to the end of July last year. The labor dispatch laws forbid dispatching workers to construction sites. This is the first time a yakuza boss was arrested in relation to nuclear power plant reconstruction work. Japan’s nuclear industry has long been fraught with yakuza connections which we first wrote about in June of 2011 for The Atlantic Wire . TEPCO is not the only nuclear power plant operator in Japan to get in trouble for using yakuza supplied labor. KEPCO (Kansai Electric Power Company) also had workers illegally supplied by a Kudo-kai front company working at their Ooi Nuclear Power Plant. A Fukuoka Police investigation in January uncovered the problem. The Kudo-kai is an extremely violent yakuza group based in Kyushu, and like other southern Japan gangs they are known for their fondness of pineapples. 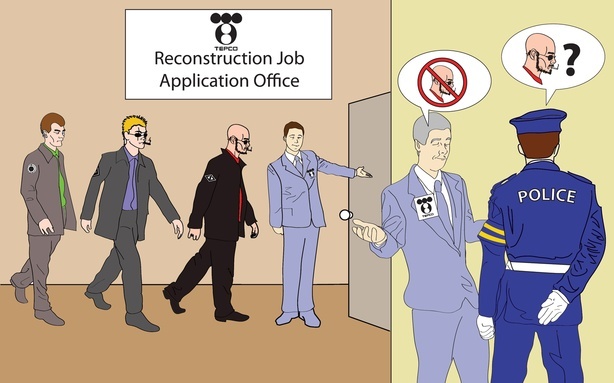 On February 10th, an expert panel of Japan’s Nuclear Energy Commission submitted a report urging the government to make it mandatory that workers and contractors involved with nuclear facilities have background checks conducted before hiring them. The panel indicated that it could be problematic to have debtors, convicted criminals, organized crime members, and other possibly anti-social elements working with nuclear energy. The report didn’t suggest that these individual be banned from the sites or handling radioactive materials but that background checks should be conducted before hiring these anti-social elements. We guess this is so that no one is surprised when these unsavory elements steal dangerous materials and sell them to terrorists. In the United States and Europe, background checks on nuclear power plant workers, including Homer Simpson, are mandated by law. The panel suggested that not only should the people operating the nuclear power plants be subject to background checks, but even the subcontracted workers as well. The panel reportedly took into account the poor management of labor by Tokyo Electric Power Company after the nuclear meltdowns began on March 11th, 2011. In fact, TEPCO’s history of malfeasance and the nuclear industries unsavory connections to organized crime is one reason the firm is on the verge of meltdown. In June we reported that yakuza were working at the Fukushima nuclear power plant as cleanup crews and manual labor, but the post-meltdown yakuza ties were only the tip of the iceberg. This month, a new book was published, Yakuza and The Nuclear Industry: Diary of An Undercover Reporter Working at the Fukushima Plant (ヤクザと原発-福島第一潜入記-鈴木-智彦) in which a former yakuza fan magazine editor Tomohiko Suzuki reports on the nuclear business-industrial-political and media complex in Japan known as the “nuclear mafia” and Japan’s actual mafia: the yakuza. The book is already generating controversy and renewed examination of Japan’s “dark empire” and its ties to the underworld. It presents more solid pieces of evidence that Japan’s nuclear industry is a black hole of criminal malfeasance, incompetence, and corruption. According to TEPCO and police sources, since the reconstruction project has picked up speed, the number of workers has dramatically increased to several thousand. The JNPA has directed TEPCO from as early as June, to keep the yakuza out—although many of the subcontractors of the subcontractors are known yakuza front companies. Over 140 workers have been found to have used fake names when getting jobs doing reconstruction work and are presently unaccounted for. In reporting for Yakuza and the Nuclear Industry Tomohiko Suzuki was able to get into the reactor as a cleanup worker under false pretenses partly by using organized crime connections. According to Suzuki, three of the fabled “Fukushima Fifty” who stayed behind during the most dangerous days of high-level radiation leaks were local yakuza bosses and soldiers. He does not specify which groups they belonged to. Even before the meltdown, it was very common for TEPCO to use temporary staffing firms that that would ultimately outsource work to organized crime front companies such as M-Kogyo in Fukuoka Prefecture and Yokohama which is backed by the Kudo-kai (工藤会). Organized crime groups from Kyushu are bringing workers as well. Many of the workers are homeless people, debtors to yakuza loan sharks, or former yakuza who have been expelled from their group. The same source noted that a TEPCO employee was arrested for insurance fraud along with a Sumiyoshi-kai member in May of this year but there was no evidence that TEPCO itself or any other TEPCO employees were involved in the crime. It only indicated that at least one TEPCO employee had organized crime connections. In January of 2003, it was reported that TEPCO had been making pay offs to the Sumiyoshi-kai for over twenty years via leasing plants and buying green tea from them. TEPCO also allegedly paid an Yamaguchi-gumi associate and former member, Takeuchi Yoichi, several thousand dollars to stop writing about safety problems at the Fukushima nuclear reactor in the 1990s. As Isao Mori reports in the recently published book Dirty Money (泥のカネ), after Mizutani Construction was named a sub-contractor on TEPCO’s Fukushima nuclear reactor waste disposal project, it paid Takeuchi’s front company “consulting fees” of around ¥120 million (roughly $1.5 million). The same firm also allegedly paid over a million dollars in under the table political donations to Ichiro Ozawa, former “kingpin” of Japan’s ruling party, the Democratic Party of Japan. (Ozawa is currently on trial for violations of thepolitical funds control law.) Mizutani Construction executives have admitted in court that it was standard practice to pay off local yakuza groups and politicians to obtain construction contracts, including those in the nuclear industry. Police and underworld sources also allege that a Matsuba-kai related front company is handling waste disposal at TEPCO plants and that TEPCO executives as recently as this summer were going on golfing jaunts with Matsuba-kai members. The Matsuba-kai is one of the ten largest yakuza groups in Japan with a strong presence in Tokyo but not a major powerhouse. The Inagawa-kai, the third largest organized crime group in Japan, with offices across from the Tokyo Ritz Carlton has also been involved in the reconstruction efforts. Most of the yakuza involvement is in procuring workers to do the jobs of laying pipes and cleaning up debris while being exposed to high levels of radiation. The yakuza bring the laborers there but do not labor there. However, heavy constructions and other work is being done by yakuza front companies or firms with strong yakuza ties. UPDATE: At the end of April, TEPCO was effectively nationalized by the Japanese government. Note: Parts of this article were originally published on The Atlantic Wire. Is there any business in JP that the Yakuza aren’t involved in? I do not think they are involved in selling Girl Scout cookies although the presence of Girl Scouts in Japan is still nominal. I have never seen Girl Scouts in Japan. Jesus. That’s all I can think of right now. Also, your phrase at the top of the article: “We guess this is so that no one is surprised when these unsavory elements steal dangerous materials and sell them to terrorists” worries me. A lot. Everyone was worried (and still is, for good reason) of former Soviet states’ scientists working with “axis of evil states” as Dubya called them for the highest bidder. Little would anyone think that Japan, a “modern” country, would have such a soft, white underbelly of weakness when it comes to enforcement of nuclear non-proliferation rules as sponsored by the UN and the major nuclear powers. I don’t doubt the safety of nuclear power done right. I doubt the human ability to exercise restraint and doing so. At least the cookies are safe, for now…. I do wonder how the governments of each country deal with this, on one side I can see the posturing of “we are CRACKING DOWN on Yakuza” however the reality of the situation seems to point to mostly “diplomatic” action taken towards the Yakuaza. It does seem that they have quite a HUGE stake in the way Japan is ran. Much like the Catholic Church an the Mafia, albeit with different reach. I’m not affiliated to those sites btw, just thought the content somewhate relevant and I enjoy the sites. Yakuza will not cut off your little finger — it will fall off by itself. Great article. One question – how is the Japanese media reporting on and handling this issue? By the way, I’m reading TOKYO VICE now – it’s an outstanding read. As someone who lived in Japan for awhile and now currently works in journalism in the US, I find it interesting on many levels. Not 6 months, at least since the beginning of April. And they were never implemented regularly, so I’m a bit confused also. Apart from that. there is also the reference to Reactor No. 2 heating up, which was already old news according Tepco by Monday 13. And this is odd also: “The labour crunch was eased somewhat when the Japanese government and Tepco raised the “safe” radiation exposure levels at the plant from pre-earthquake levels of 130-180cpm (radiation exposure per minute) to 100,000cpm.” Wasn’t that the limit for decontamination of the evacuees? Thanks I need to fix that in the text. The Reactor 2 keeps heating up and I can’t keep updating or revising the articles every time it heats up or cools down nor do I believe TEPCO when they say it’s fine. You wrote: “The labour crunch was eased somewhat when the Japanese government and Tepco raised the “safe” radiation exposure levels at the plant from pre-earthquake levels of 130-180cpm (radiation exposure per minute) to 100,000cpm.” Wasn’t that the limit for decontamination of the evacuees?—I’m quoting from Suzuki’s book so I don’t know about the other figures. That last comment from the LDP senator really hits home. But looking at from different perspective, couldn’t it be said that rural Japan is the Japanese government’s parking lot? That is why all the nuclear plants were placed reasonably far away from the capital and major metropolitan areas. All in all, a fascinating article. Thanks for all the work you do. That’s actually a very good way of putting it, sadly enough. Thanks for reading the article all the way to the end. I think foreign journalist might need to be added to that list. Can’t you people behave? Is it just me or does the TEPCO symbol look like the TDS symbol?…….hint the D stand for (big mouse)….I know on the constuction site (when I was working there in 2001) there was a lot of rolling of the rrrrrs….just like a bad old yakuza film…..